Jackie Sullivan is an Assistant Professor in the Department of Philosophy, a member of the Rotman Institute of Philosophy and an associate member of the Brain and Mind Institute (BMI) at the University of Western Ontario (Western). She works primarily in the areas of philosophy of neuroscience, philosophy of psychiatry and empirically informed philosophy of mind. She has published on a variety of topics including: unity of the mind-brain sciences, the epistemology of experimentation and mental disorders. She is co-editor with Harold Kincaid of an edited volume in philosophy of psychiatry entitled Classifying Psychopathology: Mental Kinds and Natural Kinds (MIT Press 2014). 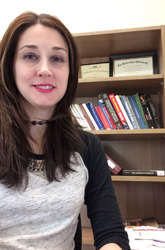 Jackie’s desire to be an “engaged” philosopher prompted her to obtain a M.S. degree in the Department of Neuroscience at the University of Pittsburgh (Pitt) and Graduate Student Trainee Certificate at the Center for the Neural Basis of Cognition, a joint interdisciplinary collaboration between Pitt and Carnegie Mellon University. While at the University of Alabama at Birmingham (2007-2012) she held a secondary appointment in the Department of Neurobiology and was actively involved in mentoring undergraduate majors enrolled in the Neuroscience and Science and Technology Honors Programs. At Western, she is actively engaged in building interdisciplinary collaborations between the Rotman Institute of Philosophy (whose slogan is “Engaging Science”) and the Brain and Mind Institute (BMI). For example, she is a co-creator of the Lab Associates Program, which trains and places Ph.D. and M.A. students in philosophy into cognitive neuroscience laboratories, where they have the opportunity to gain first-hand knowledge of neuroscientific research and play an active role in the life of the laboratory. (2014) “Is the Next Frontier in Neuroscience a Decade of the Mind?” In Brain Theory: Critical Essays in Neurophilosophy, Charles Wolfe, Ed. (Palgrave-MacMillan), pp. 45-67. (2014) “Stabilizing Mental Disorders: Prospects and Problems” in Classifying Psychopathology: Mental Kinds and Natural Kinds, Harold Kincaid and Jacqueline A. Sullivan, Eds. (MIT Press), pp. 257-281. (2010) “Reconsidering Spatial Memory and the Morris Water Maze”, Synthese 177(2): 261-283. (2010) “A Role for Representation in Cognitive Neurobiology”, Philosophy of Science 77(5): 875-887. (2009) “The Multiplicity of Experimental Protocols: A Challenge to Reductionist and Non-Reductionist Models of the Unity of Neuroscience”, Synthese 167:511-539. (2008) “Memory Consolidation, Multiple Realization and Modest Reductions”, Philosophy of Science 75(5): 501-513.